Great punk rock with saxophone on the b-side and a very sucky slow one the flip. From the country that given us Dieter Meyer, Nasal Boys and Fear Of God among others. Maybe erich from the excellent blog Good bad music for bad, bad times! can sheed some light over Santé Publique since I didn’t manage to find anything on them during my google tour. I’m a very bad patriot. I never cared too much about music from the country I happen to live in. This has to do with the fact that there simply are only a handful of records from Schwitzerland I like. I never heard of that one before, really, and it doesn’t really move me. Wasn’t there a great internet site with a nearly complete germany / austria / switzerland discography? Hell, can’t remembe what it was called …..
Yepp I found that site but it just had sleeves and song titles. The band is from Geneva. I saw them play live a couple times. They were friends with the obnoxious Yodler Killers. 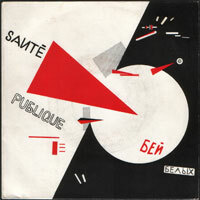 They took themselves too seriously (as the Malevitch cover of their single shows) They were big fans of DAF and Joy Division. The bass player was a wealthy Skinhead who used to board in an expensive private school. That’s realy good to know that bigotry, ressentiment and gossip will always be there when “Punkness” is being discussed. I saw the band as well. A friend of mine Christophe, was their first singer. He was a big UK Subs fan and they used to play punk covers, such as Teenage Kicks. They then refined their sound withe the sax player and a more “cold wave” style. Their guitar player, Nicolas Wadimoff, is now an excellent film director, who’s done great documentaries about third world issues.